Anselm of Canterbury (c. 1033-1109 A.D.) is perhaps most popularly known for his famous quote about the relationship between faith and knowledge. "For I do not seek to understand so that I may believe; but I believe so that I may understand. For I believe this also, that "unless I believe, I shall not understand"'. This sentiment echoed in this quote has given rise to the way many theologians think about God, and their relationship to him. "Does God exist?" Can we know anything about God's nature?? "What is truth?" Do human beings have freedom of choice"? Can they have such a freedom in a world created by God?" These are among the questions that Anselm took very seriously, and ones he sought to understand. Although utterly convinced of the truth of Christianity, he wrestled continually with these questions. He considered the doctrines of faith an invitation to question, to think, and to learn; and he devoted his life to confronting and understanding the most elusive aspects of Christianity. His writings on matters such as free will, the nature of truth, and the existence of God make Anselm one of the greatest theologians and philosophers in history. 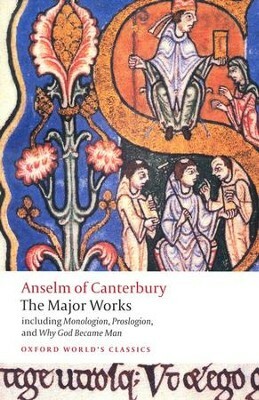 This volume, Anselm of Canterbury: Major Works features Anselm's most influential and critical writings. In includes the Monologion, the Proslogion, and the arguably his most famous Cur Deus Homo a.k.a. Why God Became Man. This translation provides readers with their first opportunity to read his most important works within a single volume. Although utterly convinced of the truth of Christianity, Anselm of Canterbury struggled to make sense of his religion. He considered the doctrines of faith an invitation to question, to think, and to learn; and he devoted his life to confronting and understanding the most elusive aspects of Christianity. His writings on matters such as free will, the nature of truth, and the existence of God make Anselm one of the greatest theologians and philosophers in history, and this translation provides readers with their first opportunity to read his most important works within a single volume. About the Series: For over 100 years Oxford World's Classics has made available the broadest spectrum of literature from around the globe. Each affordable volume reflects Oxford's commitment to scholarship, providing the most accurate text plus a wealth of other valuable features, including expert introductions by leading authorities, voluminous notes to clarify the text, up-to-date bibliographies for further study, and much more. I'm the author/artist and I want to review Anselm of Canterbury: The Major Works.